Colored etching and aquatint. Artist's proof. Pencil signed in the lower right. Edition of 200. Catalog: Fletcher 133. Plate size: 11 3/4 x 17 3/4 inches on 18 x 23 inch medium weight wove type paper. C. 1923. 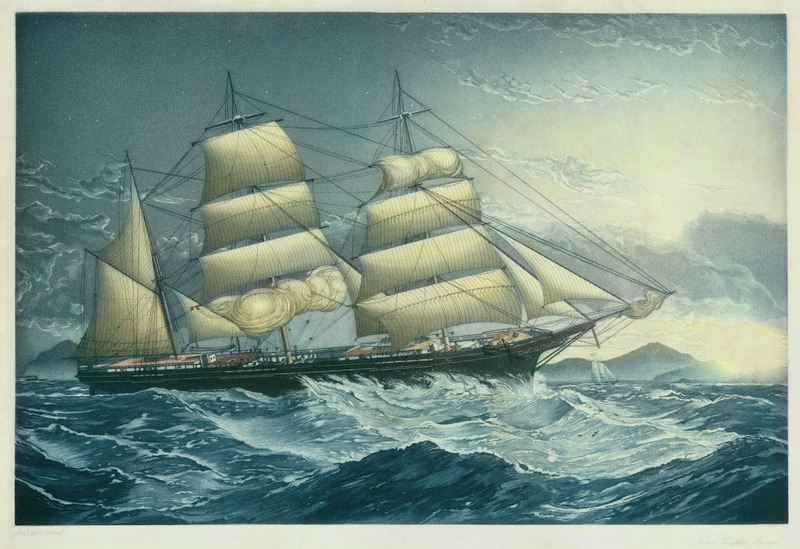 A dramatic and beautifully colored maritime etching. 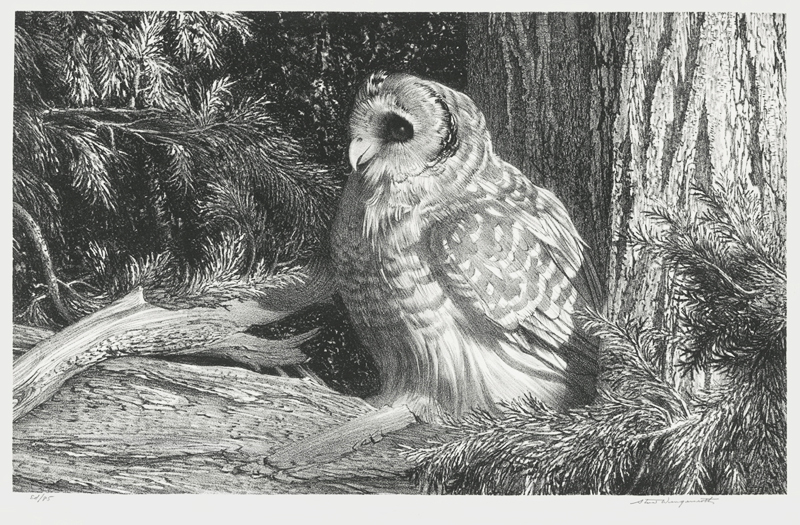 Lithograph from February 1966 of an owl in Greenport, NY. Catalog: Stuckey 304. Edition of 65. Print measures 10 x 15 7/8 inches on 13 1/4 x 20 1/8 inch wove type paper. 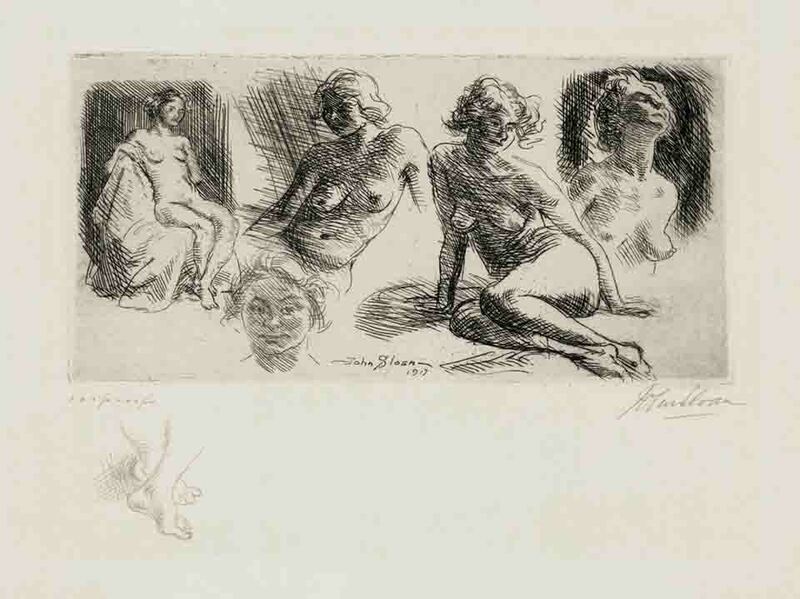 Pencil signed in the lower right, editioned in the lower left. 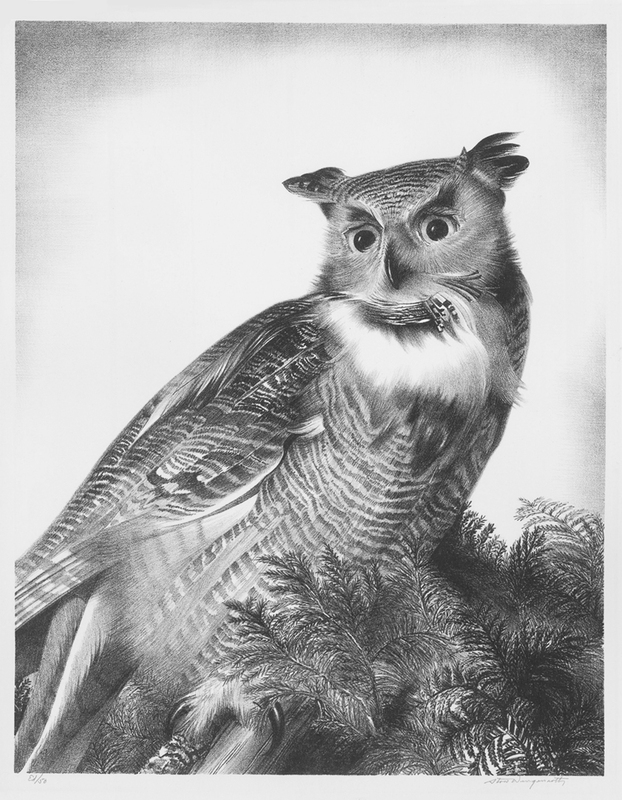 A fine example of the artist's well known Owl series. This is a very rare original etching by American sporting artist Frank W Benson. The image size is 7 7/8 x 9 7/8 inches, published in 1921 in an edition of 100, cat: Ordeman-205, pencil signed, titled in the lower margin. There is some old masking tape residue in the margins, but this is outside of the image area and will be covered by a window mat. 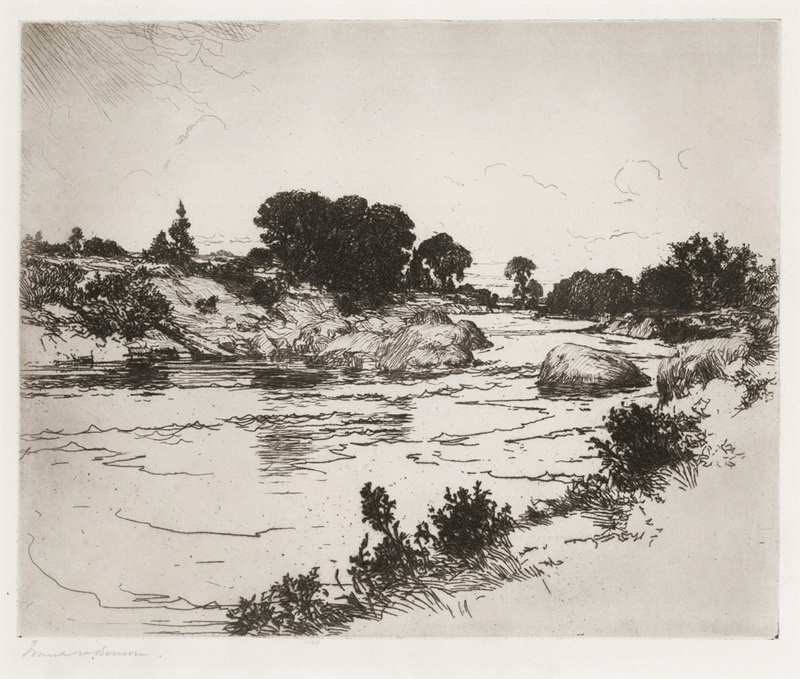 This print is quite scarce, and an unusual subject for Benson; in most of his images the landscape serves as a backdrop for wildfowl or hunters but in this etching he focuses on the land and river, creating an atmospheric summer scene. This is an original handsigned woodblock print by Latvian-American artist Isac Friedlander. 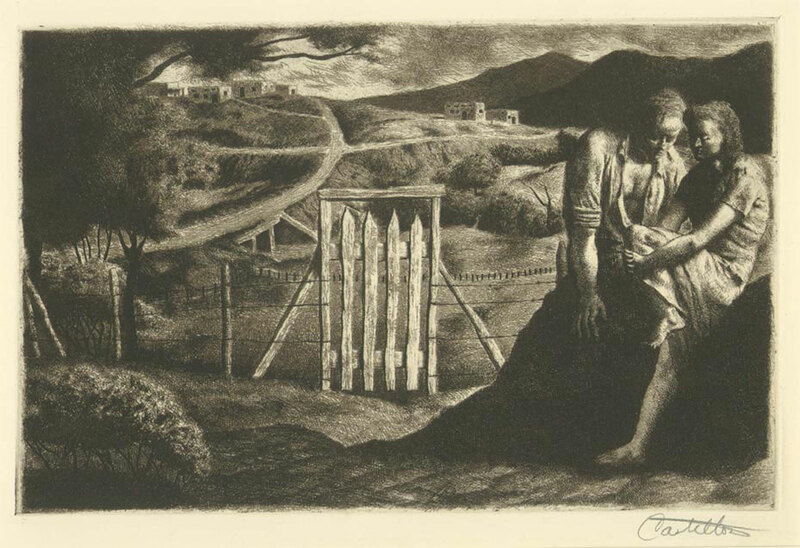 This work is titled: "Ghetto", it was created and printed in 1942. It is a very scarce image by this artist. It was created and printed in 1942. The image measures 9 3/4X10 7/8 inches. pencil signed titled and dated in the lower margin. This image was printed in an edition of only 26 signed proofs.. Isac Friedlander was born in 1890 in Mitau, Latvia. Those were difficult days for a captive people under the czarist yoke, but it was not long before young Isac’s assertive spirit emerged. At sixteen he was arrested and condemned to death, along with several of his classmates, for protesting compulsory uniforms and weekend curfews. His classmates were shot but his sentence was commuted to life imprisonment. Fortunately, Friedlander’s skills in drawing and the portraits he did of his prison guards and their children came to the attention of a local functionary, who took an interest in him. In four years he was released. The war years of the 1940’s found him deeply troubled in spirit by the reports of sufferings and persecution of his people throughout Nazi-dominated Europe. 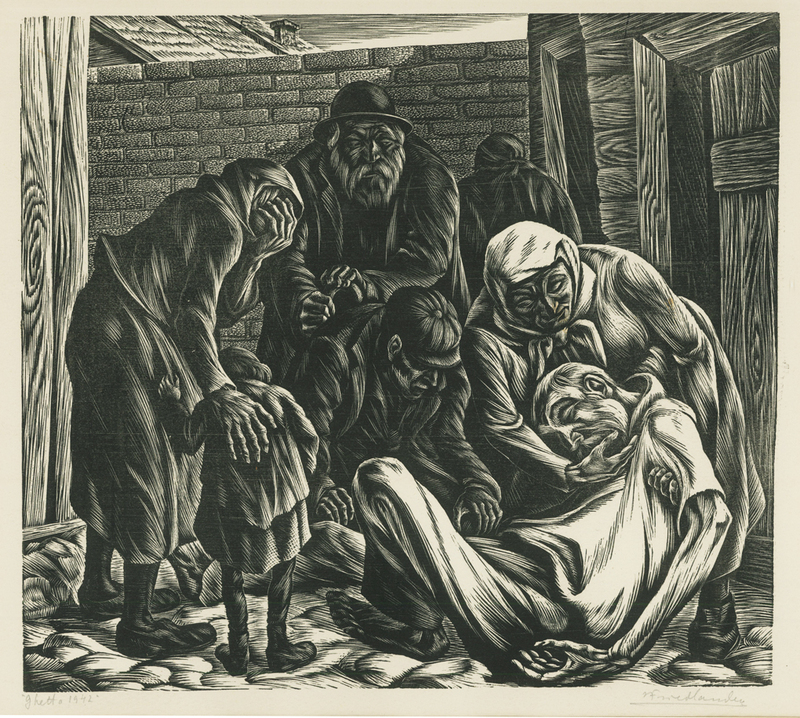 Having experienced first hand in his youth the depth of man’s inhumanity to his fellow man, he now produced his heart-rending and powerful prints of the holocaust. Friedlander’s woodcuts, wood engravings, and etchings are powerful expressions of the human condition. Death took him in 1968, but not before his spirit found renewed expression in his masterful prints of life among America’s urban blacks as the winds of social change were gathering to redress the wrongs of generations. 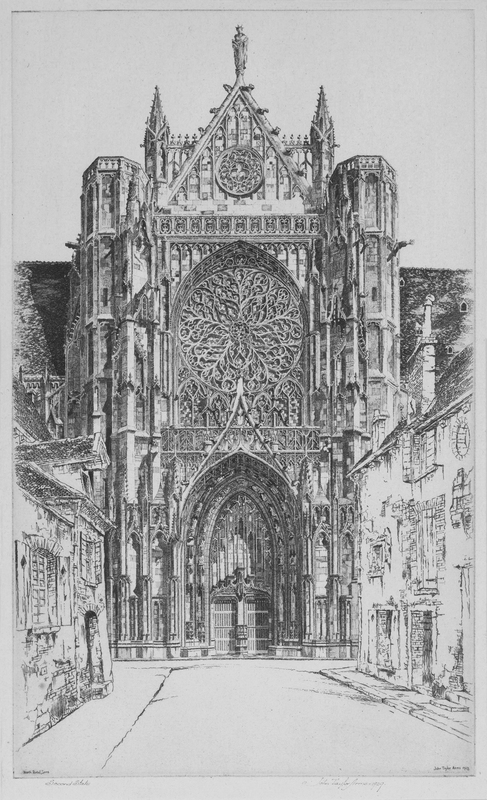 Lithograph from May 1960. Scene from New York, New York. 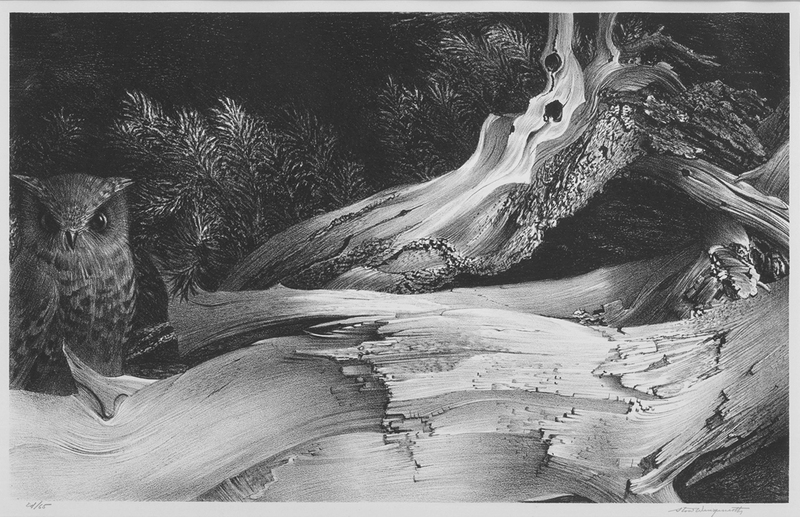 Image measures 15 3/16 x 11 3/4 inches on 19 3/4 x 15 inch medium weight wove type paper. Wengenroth has captured this majestic owl at high alert against a dramatic bright sky, framed with some plate tone on the edges. Catalog: Stuckey 269. 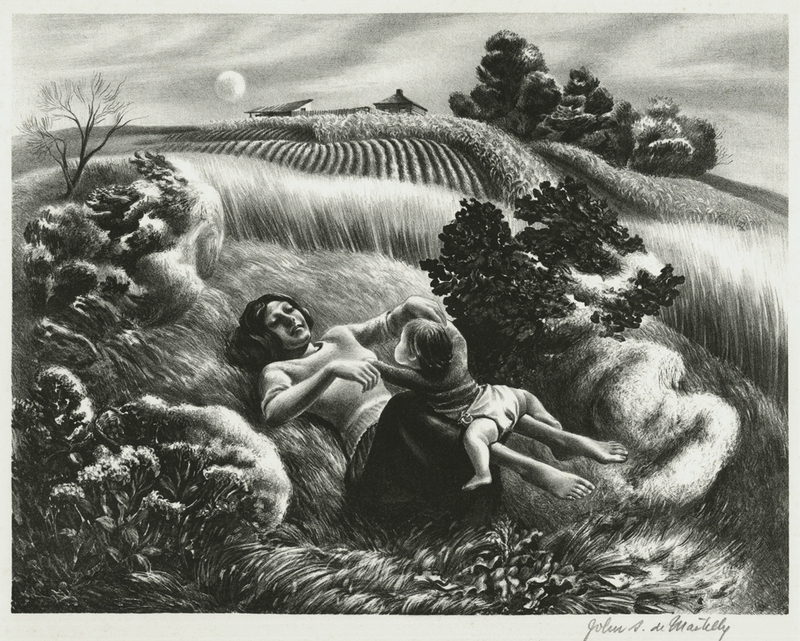 Lithograph, image size 18 x 13 inches, edition of 30, 1945, print signed, dated, edition number, and title in pencil. Plate signed "BS" l.r. Fine & Looney 246. Spruance studied in Paris after winning the coveted Cresson Scholarship in 1928 while attending college at the Pennsylvania Academy of Fine Art. He studied with Edmond and Jaques Desjobert in Paris before returning to the US and continuing his nearly forty year career as a printmaker. Lithograph from March 1970. Scene from Greenport, New York. Pencil signed in the lower right. Edition of 85. Image measures 9 5/8 x 15 5/8 inches on 13 x 19 3/4 inch medium weight wove type paper. Wengenroth has captured every detail of the texture of the subject and background. Catalog: Stuckey 331. 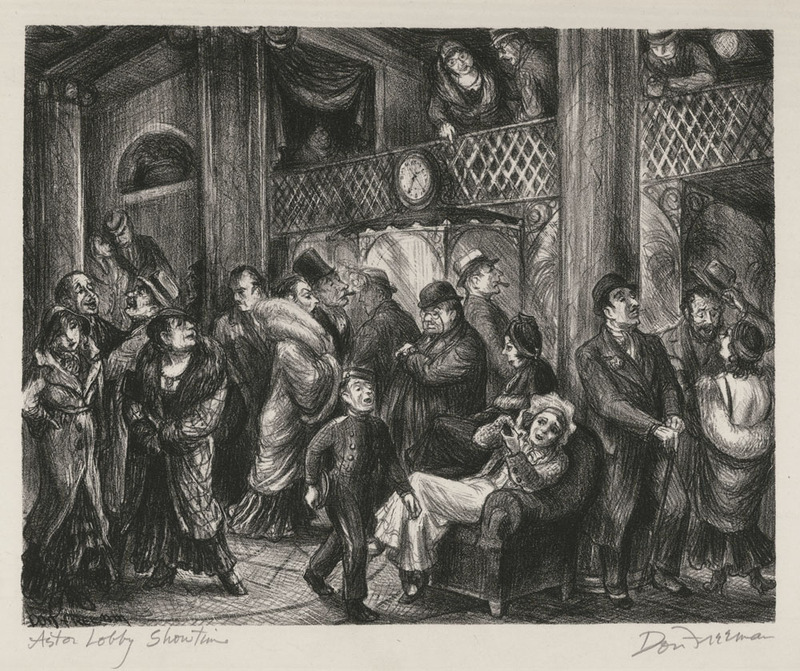 This remarkable etching is one of Eby's finest prints, and is featured on the front cover of the Giardina catalog. 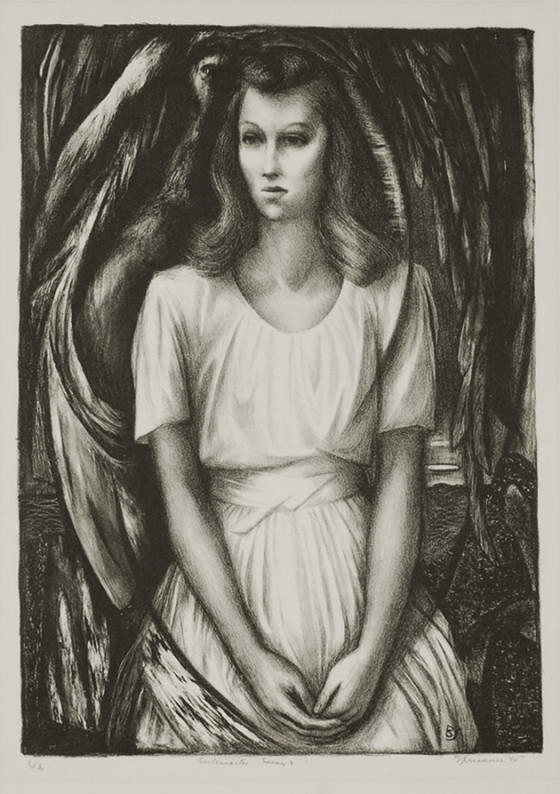 The image size is 8 5/8 x 15 5/8 inches, published in an edition of 100 in 1931, cat: Giardina-168, pencil signed "Kerr Eby imp", the 'imp' indicating that Eby printed this impression himself. This image is one of several landscapes Eby made depicting his house in Westport, Connecticut and with it's rich tonal range and vivid contrasts, it is by far one of his most impressive images. 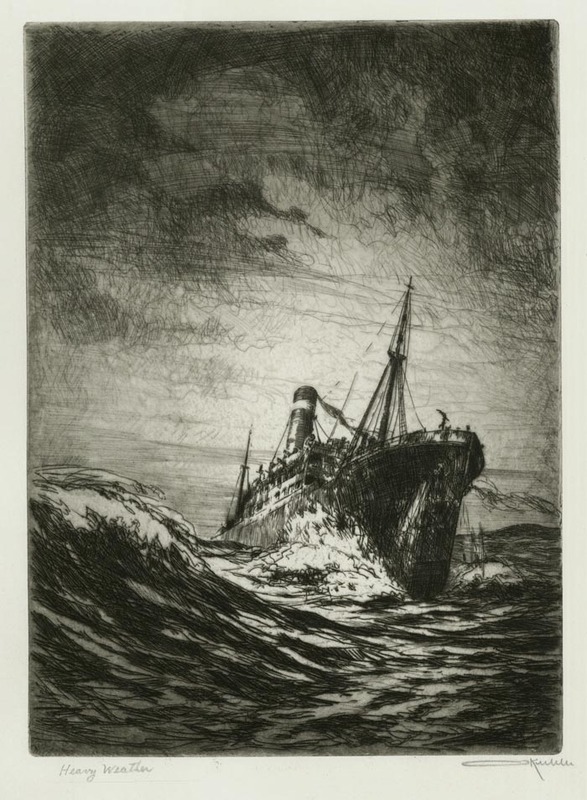 This etching features a very richly inked impression on a medium weight watermarked wove type paper. 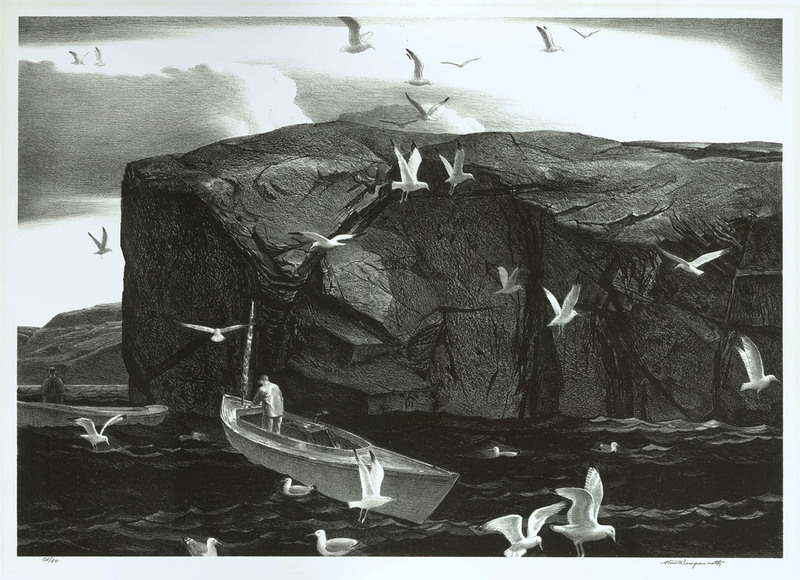 A beautiful lithograph by the American artist, Stow Wengenroth, measuring 12 1/4 x 17 1/4 inches, pencil signed in an edition of 50. This image is of Winter Harbor, Maine, created in October of 1941, Stuckey cat: 110, framed. 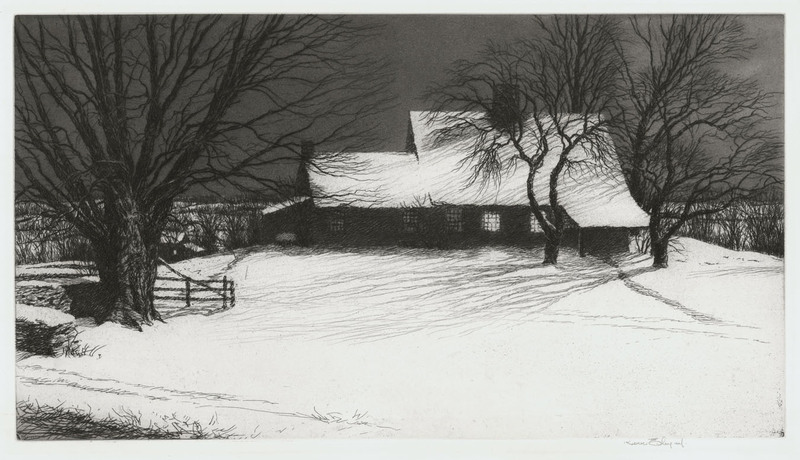 Wengenroth was one of the preeminent lithographers of 20th century America, known for his atmospheric, incredibly detailed images of the New England landscape and coastline. He studied at the Art Students League and the Grand Central School of Art in New York, and in the summers studied with John Carlson in Woodstock NY and George Ennis in Eastport ME. In 1931 he had his first one man show at the MacBeth Galleries, beginning a long and very successful artistic career.